All Lock Aid orders are sent by Priority Mail and now Half Off while quantities last! Lock Aid Pick Gun by Majestic Lock Co. 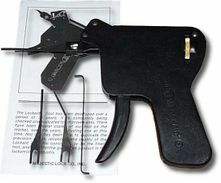 This pick gun (key gun) can be used to open most pin tumbler locks. It can work as fast as 2 seconds to a few minutes. Some beginners report that it takes time to learn how to use this tool, but as the more they practice the faster they are able to open the lock. This the Original LockAid pick gun(snap gun) considered by many to be the best gun on the market. Lifetime warranty from the manufacturer, Majestic Lock Co. Inc.
Comes with 3 picks, a tension tool, good instructions and serial number warranty card. If it doesn't say Lockaid, its not. The E-Z, Southord and Brockhage pick guns are not Lockaid. You should pay less for them. Add a Pick Gun book and save $4. Lock picking equipment are nonreturnable; defective items will be replaced within the warranty period.